The Superior Thread Holder is an amazingly innovative notion for thread delivery. It is designed to be used with both spools and cones and can be used with bobbins. The Superior Thread Holder – An Innovative Notion for Thread Delivery. Includes the following accessories – Small Spool Cap, Large Spool Cap, Cone Adapter, & Bobbin Adapter. The Superior Thread Stand Thread Holder allows you to sew with large cones as well as specialty threads as it is important for threads to unwind off the cone/spool the same pattern as they were wound. There are multiple threading options for specialty threads, including Metallic thread. The Superior Thread Holder stands over 15″ tall when fully extended, can be used horizontally or vertically, and is lightweight and portable. Do you have trouble with spool or cone wobble or can’t use the large spools with your featherweight? Try a thread stand! Do you have leftover bobbin thread that you would like to use up– try the thread stand! It is the best thread stand I have ever used and I have tried many. It is important for the thread to come off the spool in the way it is wound– are you using cross wound spools on a horizontal spool pin? The cross wounds come off the spool from the bottom and need to be vertical. The threads that are wound or stacked on a spool horizontally go on the horizontal spool pin. Do you own a machine that does not adapt to the newer spools? Use a thread stand. It is such a simple elegant solution to thread problems and will save you money as you use up your thread and have less thread breakage and tangles in the upper arm thread path of your machine. Superior’s Heavy Duty Thread Stand (metal) is a weighted, all metal thread stand. 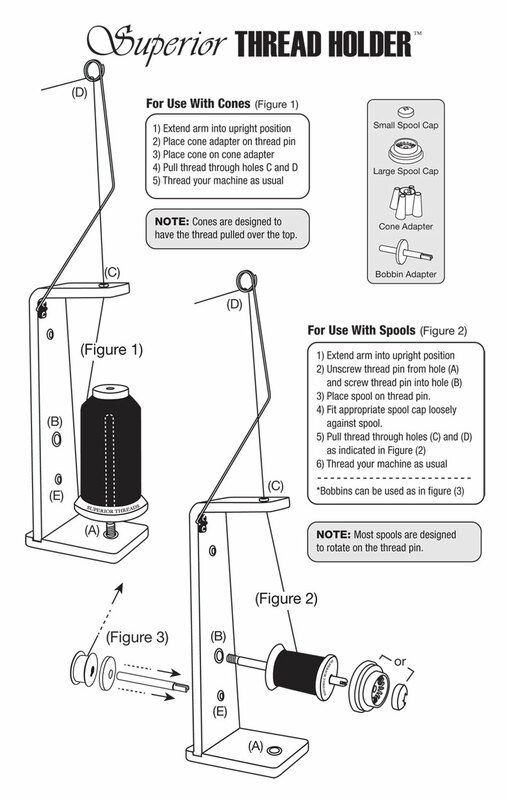 This thread stand allows cones to be used on Home Sewing Machines. It measures 18.5″ tall and the base is 5.5″ across (circular).